We’ve all used Ebay at some point or another, but sometimes all the options available can be overwhelming. What if it sells too low? What if I pay too much for shipping? Never fear! I made 5 super quick steps to getting started selling your stuff on Ebay TODAY. 1. 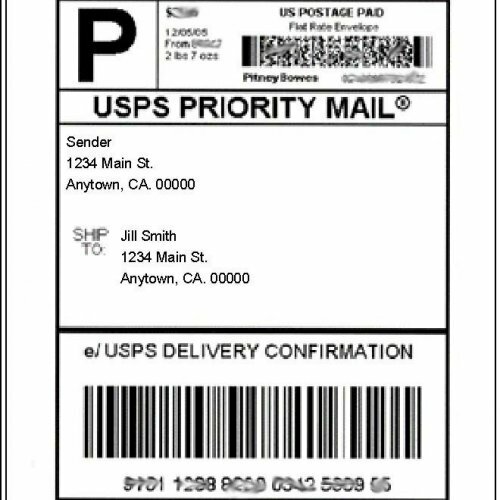 Use Ebay’s label printing service and print labels from your computer. Don’t have a scale to weigh your own items? Use flat rate option and the free USPS boxes–you’ll save money over going to the post office to buy your postage. If you sell a few items, definitely get a food scale precise up to 0.25 ounce so that you can use USPS First Class shipping and FedEx Smart Post, the cheapest options available for per pound shipments. 2. Don’t offer free shipping. Use calculated shipping. If you’re shipping something fragile, don’t forget to add in 1-2 pounds for extra packing materials to your estimated weight. Once again, if you don’t have a scale, use flat rate options. You can ship jeans, tops, dresses, and even jackets in a flat rate envelop. You can get quite a bit in medium flat rate boxes, even shoes and boots. For more information, here’s my blog posts about shipping. 3. Take photos in natural light and make sure your item fills up the frame. Use a plain background, like the floor or a blank wall, and get 4-5 different angles. Take a picture of the tag or serial number. Don’t skimp on your photos! Crappy pictures will result in poor sales. Here’s How to Photograph Clothes for Resell Ebay. Here’s another post if you want to see how NOT to photograph clothes..
4. Use descriptive, searchable terms in your title. Size, color, brand, type of thing, gender if applicable, style, etc. Whatever word a buyer might search for that fits your item, squeeze it into the title. Your title is what directs search bots to bring up your listing in the search results from buyers. Poorly written titles will get pushed to the bottom of the search results and nobody will ever find your listing. 5. List your items at 7 day auction, starting at a reasonable price. NEVER start an auction at $0.99, even with a reserve. Reserves turn off buyers. On the other hand, starting a $0.99 without a reserve can lose you money big time. It doesn’t attract serious buyers, it attracts yardsalers looking for a dirt cheap bargain. So start your item at a price you can live with. If your item doesn’t sell at the first auction, list it again as a buy-it-now for 3o days at or a little below your original auction start price. Have an Ebay listing question? Fire away in the comments below! Separator image Posted in ebay, resale, shipping and tagged with ebay tips, how to sell clothes on ebay, how to sell on ebay. Do you really sell everything at a 7-day auction? What about Buy it Now?